The Audio Drama Alliance has released a new short audio drama production today which was produced in partnership with Porchlight Family Media, Ichthus Family Productions, and other ADA partners. The script was written by ATC community member, Victoria Lynn, who also plays one of the major characters. Audio Theatre Central's own JD Sutter directed the production and also plays a small part. The story is a comedic mystery which features a police detective and his junior partner as they investigate the theft of a violin. The instrument belongs to a British violinist who is touring the United States. The clash of American and British cultures is the center point of this humorous radio play. 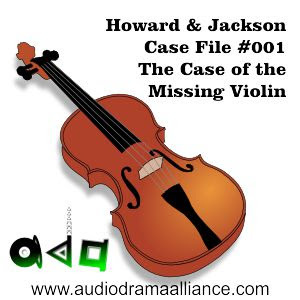 Howard & Jackson "Case File #001 – The Case of the Missing Violin" is now available to stream for free on the ADA website. It's a fun 14-minute show that we think you'll enjoy. Full credits for the show are at the link below. Check it out and let us know what you think! For more info on the ADA, click the logo below.